Scientists and farming experts are aware that worms have an important role to play to promote the multiplication and growth of plants in the soil. Aristotle as well as Charles Darwin were convinced that life on our planet could never be the same if it wasn't for those wiggling friends of ours that day and night tirelessly plough through the soil, aerate it and increase its fertility with their droppings which we know as worm castings or worm humus. So why is the earthworm so beneficial for soil and plants? Well there are quite a few reasons we should mention. 1. On their search for food worms virtually eat themselves through the soil they are in. 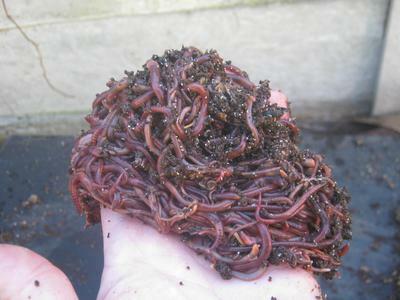 Worms are consuming soil and digest any dead organic matter that it contains, the rest will be enhanced with minerals and other soil fertilizing materials and deposited as worm poop (worm castings usually near or on the soil surface. This way worms are continuously renewing the soil. 3. Chemical analysis of comparable soil with and without a supporting worm population showed a dramatic increase of chemical elements like nitrogen, phosphorus, convertible potassium, convertible calcium and organic carbon in soil with a healthy worm population. These are just some of the outstanding benefits that worms bring to the soil and its plant life. I will elaborate further about the subject in one of me next posts.